Hundreds of residents of narrow, winding and hilly Mountainview Avenue in Valley Cottage are joining forces to oppose construction of a new church on their crowded street which already contains two other religious denominations, a large nursing home, a new Chinese resort, several public parks and hundreds of apartment and condominium units in three or four sprawling complexes directly across the street from the proposed new facility. Residents said the purpose of the meeting is to focus and coordinate opposition to proposed zoning code variances which, if granted, would permit the virtual total coverage of the vacant lot with a new two-story church and 55-car parking lot for the proposed St. Peters Syro-Malankara Catholic Church of Rockland County, which already owns the 4.4-acre lot. The site is on the western side of Mountainview Avenue, mid-way between the existing Community Bible Church at #470 and the New York State Thruway overpass near Route 59. The property slopes steeply downhill from the paved two-lane road toward the west. At the bottom of the hill is a large federally designated swampland, the centerpiece of which is a marshy pond called Bear Swamp. 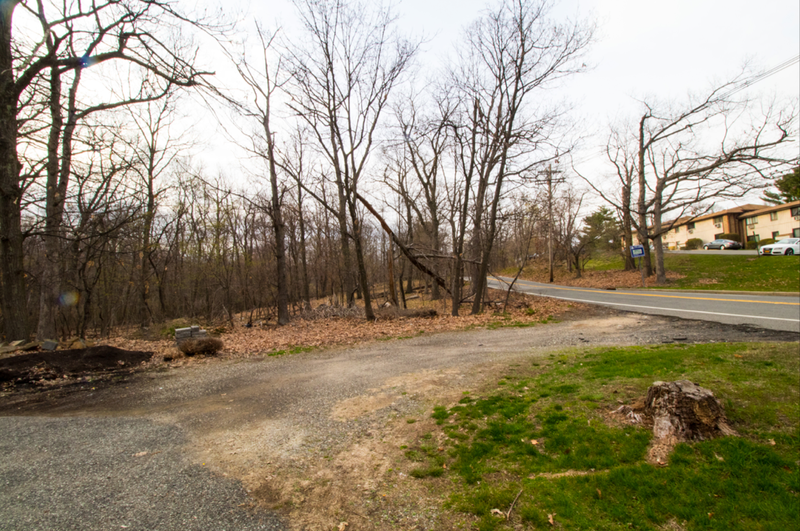 The property, which is contiguous at its western (lowest) edge with the Mountainview Nature Park, a Rockland County-owned park site, had been privately owned for generations. To pay the tax bill, the family apparently donated or sold adjacent parcels, such as the park site to the county and the adjacent lot to the Community Bible Church, among others. The family’s own home, which is the only structure remaining on the original parcel, has been vacant for several decades and is about to be demolished by the new Catholic Church which recently purchased the site. The house is adjacent to the rectory of the Community Bible Church. The 4.4-acre parcel in question is zoned R-22, meaning it can only legally be used for the construction of single-family homes on half-acre sized lots. The law as written would permit construction of a maximum of eight or nine new homes. To get more homes on the lot, or to use the land for some other purpose than construction of single-family homes, would require the owner to appeal for variances to Clarkstown Zoning Board of Appeals. That is exactly what the St. Peters Malankara Catholic Church has done. Using Brooker Engineering of Suffern as their agent, the church has requested that it be permitted to construct a 5,463-square-foot church, with an equal sized basement, and parking for 55 cars on land stretching from the street to the swamp. Brooker said the congregation was formed in 2002 as the Malankara Catholic Mission of North America, based in Elmont, Long Island. It currently has about 26 local member families and is growing, he added, and for the past 25 years has been using rented space for services, wherever they would find it locally. Most recently, they have been renting the small chapel at St. Joseph’s Parish in Spring Valley but this has proven inadequate, he explained, as the local Haitian Catholic church already uses that building for its own Sunday morning services. The congregation purchased the 4.4-acre site in Valley Cottage in 2013 “for the purpose of constructing their own dedicated facility to allow the members to conduct their religious lives in a manner that is more aligned with their religious beliefs and traditions,” Brooker explained. Unfortunately for the church, it got caught up in a “No knock” controversy that swept three of Rockland County’s five townships about two years ago, in response to allegations that Hassidic buyers with cash were attempting to purchase land in parts of Orangetown, Clarkstown and Ramapo for the purpose of creating new Orthodox and Hassidic communities by skirting existing zoning laws in those communities. To thwart the move before it could gain a foothold, both Clarkstown and Orangetown, and some villages, quickly passed “no knock” laws that prohibited buyers from soliciting sales buy going home to home attempting to purchase entire communities without being invited by the homeowners to do so. Some communities, such as Clarkstown, along greatly strengthened their existing zoning codes, prohibiting multi-family homes and increasing the requirements for almost all new residential construction. Clarkstown’s new law took effect last year. According to Brooker, his client would have no problem meeting the requirements of the old ordinance, and would have been permitted to construct their new church and parking lot by simply applying under the religious exemption clause in the original law. Because of the new law, however, their application for a building permit was denied by Clarkstown’s Building Department. Instead, they were told they had to apply for variances from the town’s Zoning Board of Appeals, which is the only local governmental agency that can grant exemptions, or “variances,” from the law as currently written. A public hearing by the ZBA on that request is scheduled for this Monday, April 24, at 7 p.m. at the Town Hall at 26 Maple Avenue in downtown New City. Brooker says in his application for the variances that his client should be granted the waiver requests from the new restrictions, which are virtually impossible to follow and render the property worthless for anything other than single-family residences. One variance is for parking, since the ordinance says they can’t be within any required front, side or rear yard setbacks, must be screened from all viewpoints and cannot be continuously paved lots but individually paved spaces. The other variance is to set aside the requirement that parking be at least 100 feet along the main road, and that it can only be constructed “on a state or county major or secondary road.” Parking lots along town roads, such as Mountainview Avenue, are not permitted at all, meaning the church could have no parking for its own members on its own land. Both ordinances unreasonably restrict the church from ever being able to utilize their new property for its intended purpose, their new home and worship center, Brooker stressed in his variance request to the ZBA. Urging every resident of the area to sign a petition against the variances, the flyer asserts, “The only chance we have to derail this environmental and quality of life disaster is with a giant turning at the upcoming public hearings. The group, tentatively without a name, does have a Facebook page called: Mountainview SVA Clubhouse Community. Organizers of the campaign say it is aimed primarily at the 987 units at Mountainview Condominiums, the 190 families at the Warren Hills Apartment complex, the 62-unit Forest Ridge townhouse complex, the 100-resident Tappan Zee Manor senior housing complex as well as the dozens of residents who live in single-family homes along winding Mountainview Avenue, from Route 59 to Christian Herald Road. Other properties along the road that might be affected include the Community Bible Church next door, the Islamic Center of Rockland County across the street, a new Chinese resort complex previously known as Mountainview Lodge and several parcels of town, county and states-owned parkland, including Mountainview Park (county), a water and communications tower complex (Clarkstown), a federally-designated swampland which allegedly cannot be disturbed and unknown quantities of animal, vegetable and mineral life as well as historic artifacts which might be on endangered species lists or never studied. One neighbor of the site who is particularly upset over the proposed development is Ed Mooney, who has lived adjacent to the property for 12 years. He and his wife purchased an antique 1860 Civil War-era farmhouse just off Mountainview, and have been lovingly restoring it and its two-acre lot ever since. Mooney said he agreed the property could be developed with single-family homes, in accord with the zoning ordinance, but said his preference was for it to somehow be preserved in its natural state. The town or the county should buy it and add it to the existing Mountainview Park at the bottom of the hill, including the slopeside, the woods and the Bear Swamp, Mooney and his wife agreed, even if it meant he and his neighbors had to pay slightly higher taxes for the purchase and the maintenance. Another neighbor, Rick Tannenbaum, has already written to the ZBA prior to Monday’s hearing, and lambasted the proposal. A quick review of public information revealed that “A substantial portion of the parcel is wetlands and connected to Bear Swamp, and that the parcel sits adjacent to and is contiguous with the county-owned Mountainview Nature Park. The request shows part of the proposed parking is on wetlands and the swamp and dangerously close to Mountainview Avenue, itself, a very dangerous winding and curving road that is already the site of numerous accidents, Tannenbaum wrote. An attorney, historian and environmentalist, Tannenbaum said water runoff from paving nearly the entire hillside would cause irreparable damage and harm to the Bear Swamp, wetlands and county park, as well as the fragile environment in general. He also noted that Clarkstown adopted its revised zoning law last year specifically to avoid such development along secondary town roads, which Mountainview is classified. The road is already extremely dangerous, Tannenbaum went on to assert; and, as an unintended shortcut to Route 59 and the Thruway in Nyack, is heavily trafficked by hundreds of tractor trailer trucks, school buses and other commercial vehicles, as well as thousands of automobiles, every day of the year. Adding a church and a large paved parking lot to that mix is just asking for trouble, the attorney predicted. Tannenbaum noted that in Brooker’s application for the variances, he checked off boxes on an environmental impact statement (EIS) form, indicating that no such tests or studies were done, or were contemplated, because neither he nor his client foresaw any environmental impact from the proposed project. “These precious wetlands should be preserved, and variances issued that permit a parking lot of this scale on environmentally sensitive land are contrary to the existing zoning code, the changes made in the local law last year and basic good environmental stewardship of our remaining wetlands,” Tannenbaum concluded in his letter to the ZBA.